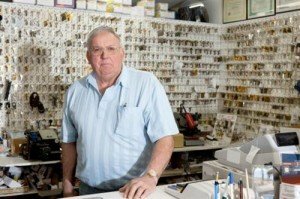 Becoming a locksmith can be an excellent career decision for those interested in finding a unique employment opportunity that does not require significant levels higher education. A locksmith usually has no degree requirement beyond a high school diploma or a GED and a vocational certification program. Further, Locksmiths are usually trained on the job, which makes it perfect for those that have the drive and initiative to succeed and are interested in learning a valuable trade that will last them the rest of their lives. According to the Bureau of Labor Statistics, a locksmith will usually make a mean hourly wage of around $18.05, which is a superb amount for the amount of training that goes into the field. Locksmiths do a lot more than simply cut keys and let people into doors that they have lost the keys to. Locksmiths can specialize in automotive locks as well as business locks, and some of them can additionally install alarms. Some locksmiths provide a comprehensive set of services and other locksmiths specialize on a specific type of job. Automotive locksmiths, for instance, may simply be on call to those that lock themselves out of their vehicle. This type of locksmith will need to learn how to use and program electronic keys, as many cars today do not have physical locks or physical ignitions. Other types of locksmith may specialize in installing new locks in doors in office buildings apartments, and still other locksmiths may primarily perform the cutting of replacement keys. Locksmiths can often install electronic surveillance systems and alarm systems, though this usually requires some extra training. Locksmiths also often need to be able to disassemble different types of locks and replace components in these locks. Some locksmiths also specialize in the opening of safes or the repair of safes, and this can also require additional training as the procedures involved can be quite complex. Locksmiths also need some specialized knowledge about the laws and regulations regarding the opening of locks and copying of keys. While there are certain locksmith training programs and locksmith certification programs, a locksmith is usually trained as an apprentice under a skilled locksmith with many years of experience. Not only does a locksmith need to learn about the physical mechanics of a lock, but they also need to learn problem solving skills that only experience and time can develop. Locksmiths need to be able to figure out physical, mechanical puzzles in order to conduct their repairs and complete their jobs. Locksmiths also often need to have very fine motor control. Those interested in related positions to locksmiths can find themselves work in the security and fire alarm installation industry. According to O*Net Online, this is one of the related industries that has the brightest outlook for future job positions. These two industries are very closely linked, which means that a person from one trade can easily move to another as necessary. Other related positions include radio mechanics and mechanical door repairers. Most locksmiths advance by forming their own companies. Due to the fact that locksmith companies are usually fairly small, and the fact that locksmiths run on an apprentice program, creating one’s own business and becoming self-employed is the primary means of advancement. However, locksmiths that are not interested in owning their own companies can also consider moving into another related field and advancing in this manner. Locksmiths that specialize highly in a specific skill, such as safe repair, may be able to advance through a large safe repair company. Likewise, those that specialize in office buildings or maintenance may end up working for a property management company or construction contractor. Overall, however, most locksmiths are either in the administrative and support services industry or are entirely self-employed.